Regime change in Iran has long been an ideal scenario for conservatives in America’s foreign policy circles. A confluence of factors currently playing out in Iran may dovetail into a situation where the country may indeed go through a regime change, but not of a type aligned with American interests. Protests against a worsening economic situation have roiled Iran’s towns and cities throughout 2018, and are likely to be exacerbated by the re-imposition of American sanctions. Unlike earlier protests in 1999 and 2009, which were led by the urban middle class and mostly located in Iran’s major cities, the current protests vary widely in their social composition and geographic spread. These protests have been led by those long considered loyal to the regime – the blue-collar and bazaari, or merchant, classes. The protests have also been more geographically dispersed – in small towns and villages as well as important pilgrimage centers like Mashhad, the hitherto stability of which has helped confer clerical legitimacy upon the Iranian regime. Now, in many instances, protests against the deteriorating economy have metamorphosed into demonstrations against the regime itself. The most recent protests erupted in December and were led by different groups – steelworkers in Ahwaz, teachers’ unions in Isfahan and students in Tehran. Senior government figures in Tehran have publicly voiced concern that the protests are likely to continue this year as the government struggles to respond to a worsening economy. This is likely to be accompanied by continued infighting within Iran’s political class. Indeed, the American withdrawal from the Iran nuclear accord and the lack of foreign investment from Europe has politically weakened President Hassan Rouhani, who had cited the nuclear accord and expected economic windfall as one of his government’s principal foreign policy achievements. Iranian conservatives, led by Supreme Leader Ayatollah Ali Khamenei, have sharpened their political attacks on Rouhani and his moderate faction, accusing them of naivete in their understanding of foreign policy. The political mudslinging between Iran’s political factions is likely to continue just as the Iranian polity is poised to enter a period of volatility, with parliamentary and presidential elections scheduled for 2020 and 2021 respectively, and with no clear successor in sight to the 79-year-old Khamenei. Political instability and the resultant policy paralysis could sharpen ongoing protests in the county and threaten to delegitimize the entire Iranian political class in the eyes of ordinary citizens. This is unlikely, however, to lead to an overthrow of the Iranian regime in favor of something palatable to the US. Even as the US has re-imposed sanctions on Iran leading to much economic difficulty in the country, American strategic choices in terms of a broader disengagement from the Middle East are likely to benefit Iran. Even without President Donald Trump’s recent announcement of a troop withdrawal from Syria, the eight-year civil war has been slowly but surely coming to an end chiefly in favor of the Assad regime. This is being viewed as a significant strategic victory in Tehran and will greatly strengthen the already much-lionized Qasem Soleimani, commander of the Quds Force, the foreign arm of Iran’s Islamic Revolutionary Guards Corps (IRGC). Soleimani, who has been the subject of many fawning documentaries and songs in Iran, enjoys near-rock star status. He is viewed as the architect of Iran’s successful campaigns against ISIS, and responsible for turning the tide of the Syrian civil war in favor of the Assad regime, thereby achieving a major Iranian strategic goal. Soleimani has twice before, in 2013 and 2017, been touted as a potential presidential candidate, only for him to turn down the offer to focus on military campaigns in Iraq and Syria instead. This does not mean, however, that Soleimani is unlikely to intervene decisively in the Iranian political sphere, should ongoing protests spiral out of control. He has in the past threatened to intervene in Iran’s domestic politics. In 1999, when massive anti-government student protests erupted in Tehran, Soleimani co-wrote a letter to the then president, Mohammad Khatami, obliquely warning of a coup against the elected government if it did not crush the protests. Soleimani is also a skilled political operative, having played a key role in Iraq after its recent general elections in cobbling together a coalition of pro-Iranian political parties to counter the electorally victorious nationalist-communist bloc. 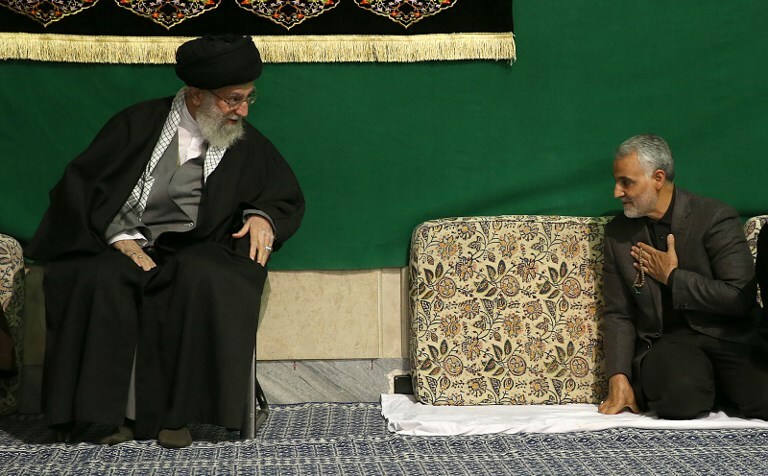 Should the situation arise, Soleimani’s giant stature in Iranian politics, his outsized role in shaping its foreign policy and his popularity in Iranian society will render an ailing Khamenei’s acquiescence to a Soleimani-led military intervention a moot point. An Iran with a military-dominated government is likely to come up with coherent short-term policy responses to the country’s economic situation. This is because the IRGC will be more amenable to bypassing Iran’s sclerotic constitutional policymaking process, and because its already dominant position in the economy will make it better able to marshal economic reform. On the foreign policy front, however, a Qasem Soleimani-led Iran is likely to entrench itself into ongoing Middle East conflicts even further. It is incumbent upon the US and regional governments to factor this distinct possibility into their strategic calculations for 2019 and beyond.